Most importantly, they were distributing footwear for the refugees. These are classed by the charity as high value items because of their importance in cold, wet weather and the need to avoid medical problems that arise from having constantly cold, wet feet. It is a constant struggle to keep warm and dry as being wet and cold quickly takes its toll on the body and spirit. The volunteers were also providing hot drinks and just as importantly, taking care to engage in conversation with as many people as they could. A friendly word and a smile go a long way here. The third main service was to enable people to recharge mobile phones. These are a lifeline for people desperate for contact with family and friends. Amazingly, there was also a Care4Calais barbering service in operation. It was clear that this was an important way of bringing another element of humanity and dignity to the lives of the refugees. We all know that feeling of being freshly groomed and able to present yourself to the world with renewed confidence. That same day, volunteers from another charity, Refugee Community Kitchen were serving a hot, nutritious meal while the French Red cross was also on hand to provide some basic care and advice. The briefings at the start and end of the day are an important part of the C4C operation. Looking around Verrotieres I could see a few tents and makeshift shelters that are the nearest thing to home for the refugees. However, these are far from permanent dwellings as the authorities will not allow anything like the old Jungle to take form. The French police regularly trash the tents and shelters often at night. This is the hostile environment in which the refugees live. The authorities have also fenced off some of the small areas of scrub and woodland in which some refugees used to take shelter meaning that more people are having to take refuge at night under motorway intersections and the like. Here it is impossible to pitch a tent and escape the wind or the attention of hostile outsiders. Much had been in the news over Christmas regarding the “major incident” as home secretary Sajid Javid called it. He cut short his holiday to deal with this ‘crisis’ of migrants taking to boats to cross the channel to the UK. The numbers involved were relatively small, perhaps a few hundred, compared with the numbers involved in the Mediterranean, for example. Speculation regarding the reasons for being willing to risk crossing the world’s busiest shipping lanes in the middle of winter in flimsy, overcrowded vessels included the looming Brexit deadline and the worsening, heavy-handed approach of the police in France. I certainly felt that tension in and around the camps was greater than my last visit almost a year ago. Providing hot drinks is very important, wherever the refugees are. The day for the volunteers at C4C ends with a debrief that provides an opportunity to reflect on the day and to share experiences and thoughts. 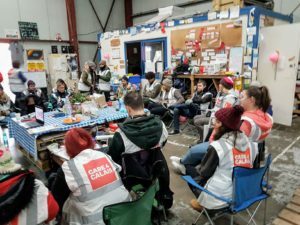 It takes place in the warehouse on the edge of Calais that has served as the charity’s base since the old Jungle was dismantled in October 2016. The following day started with the morning briefing at the warehouse when the plan for the day was shared and jobs allocated. The atmosphere is warm and friendly with everyone willing to pitch in to help. The rest of the morning is spent preparing for the afternoon’s round of distribution that included dry clothing, hot drinks and high nutrition food such as energy bars. 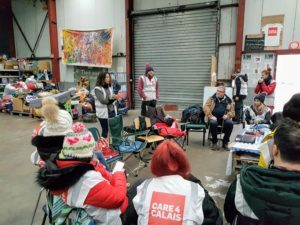 There are regular stops for the volunteers in and around Calais but regular trips are also made further afield to Dunkirk, Caen, Brussels and Paris. I was only able to spend a short time in Calais on this trip. 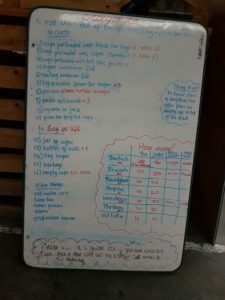 However, it was enough to provide a snapshot of both the awful conditions which face the refugees and the outstanding work done by the volunteers ably led by C4C’s excellent coordinators, Jess and Ash. 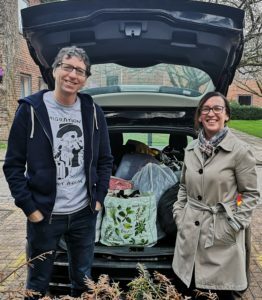 If you have ever considered volunteering with C4C or one of the other organisations operating in support of the refugees, I would urge you to give it a go. It will provide you with an opportunity to do something positive and to gain an insight into what life is like for those who, through no fault of their own, find themselves living an immensely challenging existence. 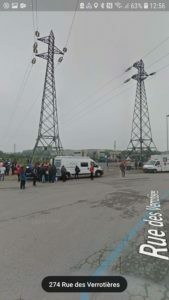 This entry was posted in news, NGO news and tagged C4C, Calais, France, NGO, Red Cross, Refugee Community Kitchen, support by Mike Stoddart. Bookmark the permalink.